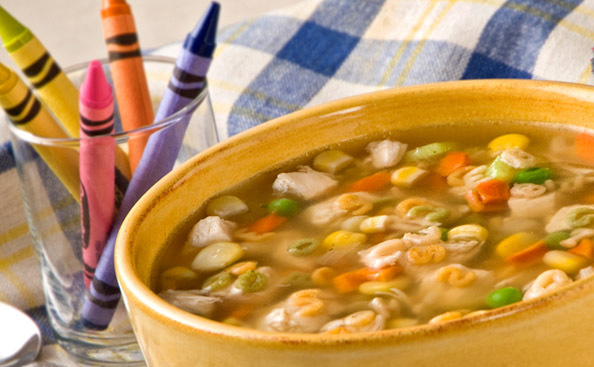 Frontier Little Schoolhouse Alphabet Soup is a tasty soup mix with all the numbers and letters in the alphabet in a colorful medley of organic pasta, the youngest chefs will enjoy a classic chicken soup supper. 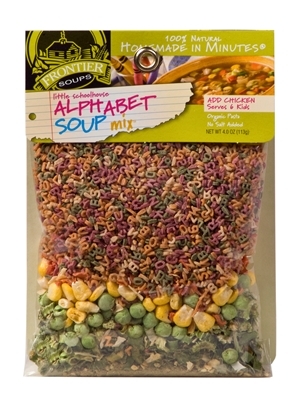 This soup mix is especially designed for kids learning the ABC's of nutrition and reading. Enjoy cooking with your child and serve up a warm, satisfying meal to please the youngest tastebuds. In a two or three quart sauce pan bring broth to a simmer. Shred or cut up chicken to soup pot. Cover pot and allow soup to simmer 15 minutes. Turn off heat and let cool five minutes. Serve with crackers for a tasty supper or lunch for kids of all ages. Organic Durum wheat pasta (60% of packaged mix), carrot, onion, Non-GMO freeze dried corn, peas, celery, scallion, garlic, savory and dill. No added salt, preservatives or MSG.